Born and raised in rural Indiana, David Varnau grew up appreciating the lyrical in nature all around him. A wide-eyed nature child, he developed an eye for the subtle and sometimes striking beauty of everyday moments and encounters in his environment. While pursuing a Bachelor’s Degree in Psychology at Loyola University of Chicago, he found himself fascinated with watching people of all ages and races in a large urban center and was intrigued by the language of the body as it expressed the range of human emotions. David’s decision to spend a year abroad in Rome during his junior year stimulated a lifelong love of classical sculpture. Then, upon completion of his degree, his work in psychology as a rehab counselor provided him with valuable insights into the vulnerable side of human nature. While receiving post-baccalaureate training in the field of prosthetics at UCLA, David gained an in depth education in human anatomy and biomechanics. This launched a rewarding 35-year career of serving amputees and provided him with an appreciation for the human spirit’s capacity to transform loss into victory. David’s prosthetic training and his interactions with his patients provided him with an eye for the wonders of the human body and a heart to sense the essence of the person before him. 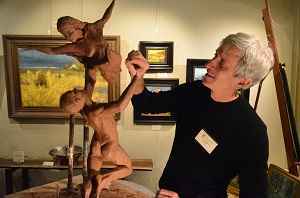 This was his milieu and it stimulated his yearning to express his insights in sculpture, leading David to pursue his art studies at Gage Academy in Seattle. My artistic mission is to generate allegories in bronze and glass that mirror the narrative of our lives. This, in turn, provides you the viewer with a glimpse of your own reflection. Whereas some of my works reflect a tranquility that seems almost eternal, others are very dynamic and kinetic. Some seem lyrical and light hearted, some are grief struck and still others are uplifting, even stirring. But all speak to the human condition and the spectrum of our experience through the compelling beauty and the singular expressiveness of the human body. Thus, while rendering the individual, I attempt to express the universal; while capturing a moment, to convey the timeless.